Champions-elect Wanderers cruised to a two-goal half-time lead, following goals from Alfred N’Diaye (12 minutes) and Helder Costa (21). But QPR refused to accept defeat – and were back within a goal of their hosts after Conor Washington’s acrobatic effort in the 51st minute. A thrilling affair ensued thereafter, with chances aplenty at both ends, though unfortunately the R’s were just unable to come up with a second for their spirited showing after the break. Following last weekend’s 1-0 home victory over Barnsley, Hoops boss Ian Holloway made just the one change to his starting XI for the trip to the Black Country. Jake Bidwell came in for Matt Smith. Meanwhile, a knee injury kept Massimo Luongo on the sidelines, while Ryan Manning served the first of a three-match suspension after his sending off against the Tykes seven days ago. Rangers – initially taking on a 5-4-1 formation – lined up as: Alex Smithies; Pawel Wszolek, James Perch, Nedum Onuoha (captain), Joel Lynch, Jake Bidwell; Jordan Cousins, Josh Scowen, Jack Robinson, Luke Freeman; Washington. Wolves went into this contest some 11 points clear at the top of the Championship table. But it was Rangers and Washington who squandered two good chances to lead in the first five minutes. Both opportunities came on the back of some pressing play by the R’s. In the second minute, Scowen won back possession before releasing Washington, who drove at the home defence before shooting straight at John Ruddy from 18 yards. And three minutes later – after being slipped in by Freeman this time – the striker was again denied by Ruddy from 12 yards, who tipped the ball around his right-hand post. Rangers were soon made to pay the price for passing on those early chances. Nuno Espirito Santo’s men were ahead come the 12th minute, as Ivan Cavaleiro crossed from the left for N’Diaye to convert from six yards. And after Wolves had strong-looking appeals for a penalty waved away, following Onuoha’s challenge on Diogo Jota in the box, they doubled their lead in the 21st minute. Cavaleiro was again the architect, racing onto Jota’s ball before squaring to an unmarked Costa, who finished with ease from eight yards. Needless to say, Holloway’s men were now firmly up against it and, in the 26th minute, Smithies did well to prevent Jota from adding a third with a save at point-blank range. 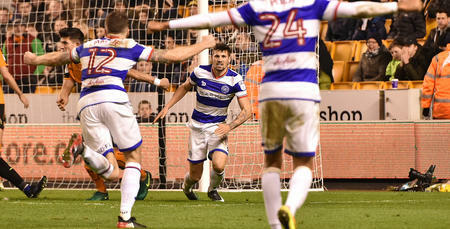 Rangers’ goal – being attacked by a free-flowing Wolves team now full of confidence – continued to lead a charmed life up until the break. In the 38th minute, Jota flashed another home effort past the upright. QPR were also forced into a change on the stroke of half-time. Ebere Eze replaced Perch, who appeared to pick up a knock. Holloway then used his second substitution ahead of the second period, with Cousins making way for Smith. 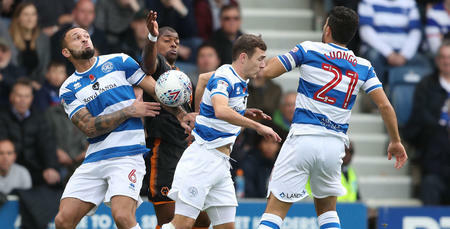 Smith’s impact was almost instant, as he was heavily involved when QPR halved the deficit six minutes after half-time. Following a short-corner routine, the ball was eventually sent over for the imposing forward to force a fine stop from Ruddy, before Washington followed up to find the net with a fantastic overhead-kick effort. Left with it all to do at the interval, Rangers were now firmly back in the game and, in the 53rd minute, sub Smith himself almost equalised when he chested down a free-kick from deep before blasting only inches over. 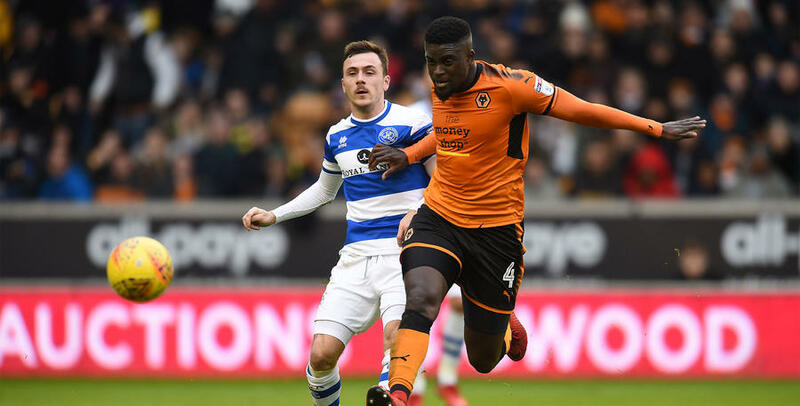 You felt an end-to-end spectacle was now in the offing – and QPR had Robinson to thank when Wolves capitalised on a midfield mistake in the 63rd minute. Jota raced through on goal, though the defender got back in the nick of time to turn the ball away for a corner. Rangers posed more of an attacking threat in the closing half – and Ruddy was tested again 20 minutes from time. Eze’s initial edge-of-the-box effort fell to Wszolek, whose attempt from a similar distance was pushed around the post by goalkeeper Ruddy. Then, three minutes later, Eze’s delicious low pass freed Wszolek down the right, whose subsequent centre was taken off the toes of a waiting Washington on three yards. The R’s continued to push forward thereafter in what remained an open encounter. Could the Hoops find a levelling goal? Ten minutes before the end, Wolves sub Benik Afobe headed wide on 10 yards, before Matt Doherty and Afobe again missed excellent chances soon after. At the other end, in the 88th minute, Eze’s volley from range forced a smart take from Ruddy. And two minutes later, in the final minute of normal time, Washington was again thwarted by Ruddy before Eze’s shot was hacked off the goal-line. However, Holloway’s charges couldn’t ultimately complete the comeback, with Scowen shooting marginally wide from distance shortly before the final whistle was sounded. 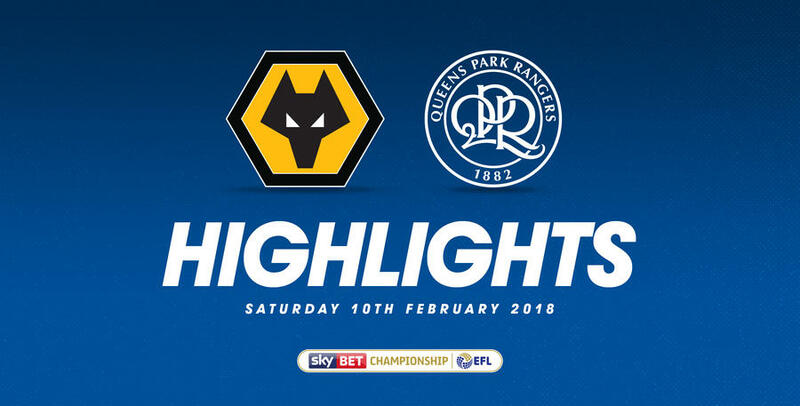 WATCH highlights from QPR's 2-1 defeat against Wolverhampton Wanderers.